A decoration that can be used to display messages and artwork. 1. Gather your material. 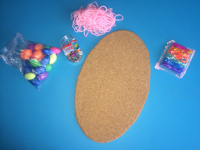 You will need an oval cork board (pre-cut or cut your own), pastel elastic hair ties, pink yarn, tiny plastic Easter eggs, and pastel thumbtacks. 2. 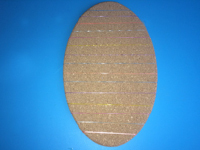 Carefully slide the elastic hair ties over the cork board to represent Easter egg stripes. 3. Use the thumbtacks to create zigzags as shown. Obviously, this project is for older children and constant supervision is necessary. 4. 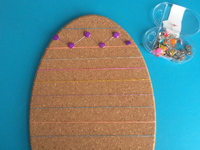 You may also choose to simply press the thumbtacks here and there all over the cork board to decorate your Easter egg shape. 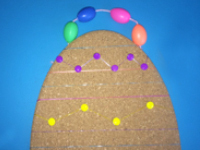 If you prefer, stick tiny Fun Foam Easter shapes on the board to avoid the use of thumbtacks. 5. Cut a small piece of pink yarn. Thread four plastic eggs on the yarn. 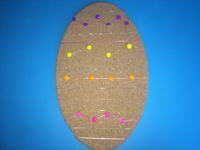 Using thumbtacks (or glue), stick both ends of the yarn behind the cork egg to create a handle that can be used to hang your Easter bulletin board. 6. 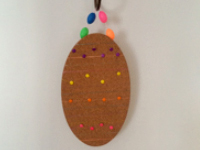 Hang your Easter bulletin board within your daycare.